Just got a brand new 2XL. It was at 100% battery this morning and now after 5 hrs it's at 60%. Now I have been on FB and YouTube but I still think it's pretty low after 5hrs. What can I do to see what's eating up the battery so fast? I don't use Facebook, but I've heard the Facebook app is a battery killer. Google "Facebook app" and "battery life". You could go into Settings > Battery and see if there are any apps that are using a lot of battery. As long as you are in the battery section I would be curious to see how much screen time you've used since it was at 100%. 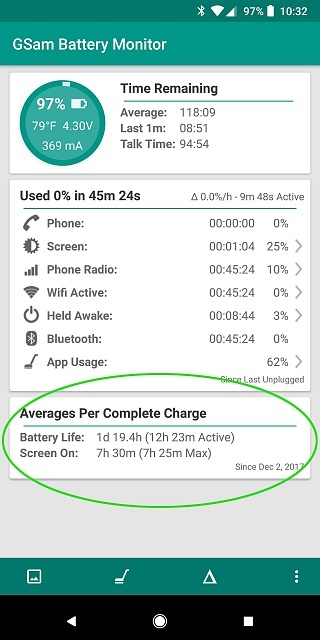 This is under "Screen usage since full charge". What number do you see there? Another option is to install a battery app like AccuBattery that tracks which apps are using power. Right now it says 3hrs 11min since full charge. In time, you will get a notification if you have an app that is really eating away at the battery. You can also check in Settings/Location/location/Advanced/Scanning to see if WiFi and Bluetooth scanning are enabled. These, if enabled, gobble up battery also. The Weather Channel app also is a battery hog. So let's wait for a week or so before worrying about the battery. Everyone getting a new device plays on it a bunch in the first several days. OK, that's over 3 hours screen-on time and you still have 60% battery remaining. That means you were on a pace to get over 6 hours of screen time on a full charge. That's pretty darn good. What was your previous phone? Not many phones can get 6 hours of screen-on time on a charge. OK, well maybe you could get 6 hours screen time with your Turbo 2. My previous phone was a Droid Turbo 1. I could occasionally get to 6 hours screen time. 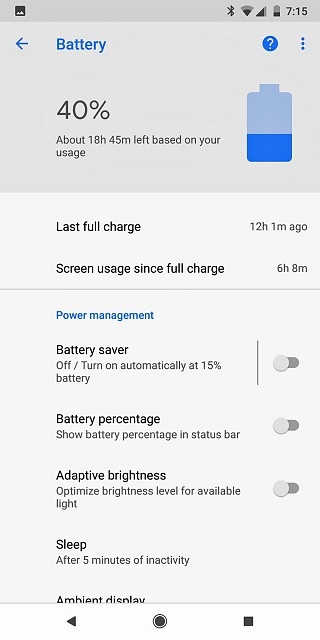 Here are some screenshots of battery life with my Pixel 2 XL. The first one is about 3 weeks into ownership. The second one is after about 6 weeks of ownership. Welcome to your Google Pixel 2 XL! I have a Pixel 2 and love it! I'd wait a little while before worrying about the battery - Google will learn your usage over time and adapt. Also, as another user stated above me, you're going to be playing around with your phone a lot in the next few days - and you'll be downloading apps, tweaking things, and spending more screen-on-time getting settled in. No need to worry just yet! What's your favourite feature on your Pixel 2 XL so far? For FB, try turning off all unnecessary permissions, especially location. I find that when apps poll my location all the time, battery life suffers. I stopped FB from running in the background. That helped quite a bit. There is a "Facebook Lite" internet app that could be a worthwhile replacement to the actual, full-featured Facebook app. Battery life seems fine for the 2XL. 60% with 3 hrs SoT in 5 hrs off charger isn't bad at all. My pixel battery is pretty bad - I turn on battery saver which helps a bit. Battery life fell off a cliff in past week or two...anyone else?